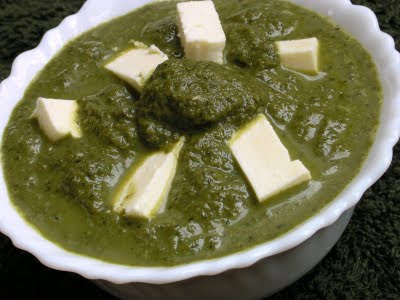 Palak Paneer is a popular vegetarian North Indian preparation, specifically originating from the province of Punjab. Palak means spinach in hindi and paneer meaning cottage cheese. If you would like to have a go at home-made cottage cheese, then click here. Palak paneer is a good way to get kids have their spinach. My little girl is so fond of cottage cheese that she will first finish all the cubes up and then she will look at everyone else's plate and ask for their cottage cheese! How do you like to have cottage cheese? Do share. Chop off the roots of the spinach and wash clean adding salt. Then chop the spinach. Roughly chop the onions and tomatoes. Cut the cottage cheese into long cubes and keep aside. Heat oil in a pan and saute the onions with the ginger-garlic paste. Add the dry fenugreek leaves/ kasoori methi. Enjoy the aroma as you stir in the leaves. Add the chopped tomatoes and cover the pan and allow to cook. Stir the mixture so that the juices blend. Add the chopped spinach, cover and cook. Once the spinach is done, stir in the evaporated milk. Cool the mixture and puree it. Add milk to lighten it. Heat the pan again with the puree. Add the dry spices and salt to taste. Add milk to get curry consistency. Once the curry begins to bubble add the cubed cottage cheese. Serve hot with rotis, or rice. I haven't tried this yet. I've been wanting to make my own paneer since last month but I haven't done it. I hope to make it soon. That looks very healthy. I love cottage cheese. I always add flaxseed oil and some marmalade and eat it that way...very delicious. Flaxseed oil and cottage cheese mixed generates a synergic health effect. That sounds great! Thanks for sharing. Do give it a shot. The difference in taste of ready made and homemade is remarkable. I used to fry the paneer when I first tried this recipe, but frying is not the healthy option. And if you use homemade paneer, you would prefer to have it as it is.Do give it a shot and see. Yum, this is one of my fav Indian dishes. Doesn't hurt that it's healthy. Shirley, this is a wonderful recipe in the way of healthy delicious and flavourful at the same time. I haven't try this before. I think I should learn how to come out with the cottage cheese first! hehe... Since it sounds soooo delicious. Thanks for sharing it. Cheers. And happy holiday to you & your family.